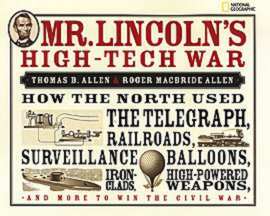 I have just been doing various updates and tweaks to the website for a book my father and I wrote for National Geographic — Mr. Lincoln’s High-Tech War. Just by the nature of the beast, in any website there are always typos to fix and tweaks to the text to deal with, and, as time goes by and other people update their websites, links that get broken and lost. So, it was time for a little maintenance work, and, as a result, a bit of a trip down memory lane. What really struck me is how proud I am of this book, and of how many good stories we were able to tell with it. The website consists, in large park, of some (by no means all!) of the material we simply could not fit between the covers of the print book. The website is, in effect, volume two of the printed book. We organized the information to key into the chapters of the printed book, but the website stands on its own as a source of fresh takes and unusual angles — and, dare I say, a few original insights — into the American Civil War. Click on the link or the book cover to visit the website. I’ll be glad if you do — and I think there are good odds you’ll be glad as well.